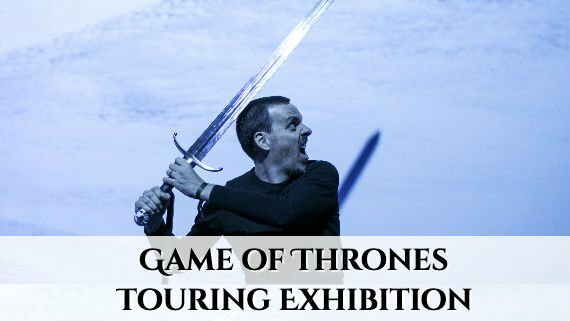 We are the only tour company from Dublin that includes the entrance fee to Game of Thrones™ Touring Exhibition in Belfast. 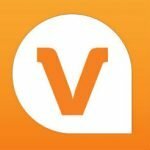 Check our FAQs or email to ask now. 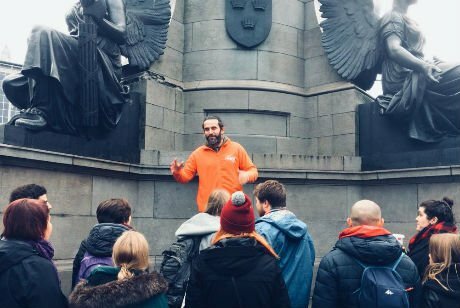 This Game of Thrones™ & Giant’s Causeway tour from Dublin is a great way to see some of the best places in Northern Ireland, even if you’re based in Dublin. Just because you’re spending most of your trip in the south of Ireland, it doesn’t mean you have to miss out on the world-famous Giant’s Causeway or some of Northern Ireland’s famous sights that have featured as filming locations for the hit HBO show Game of Thrones™. 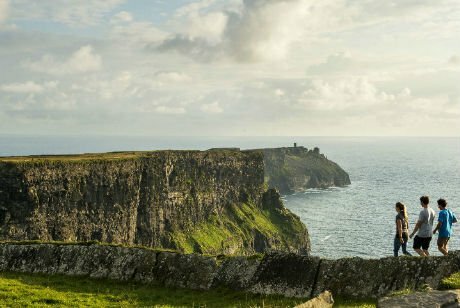 Visit Ireland’s little corner of Westeros and the legendary Giant’s Causeway! If you’re interested in this tour, you may also be interested in our Cliffs of Moher from Dublin tour and our Glendalough and Wicklow tour from Dublin. 0635 We start boarding outside Dublin City Gallery The Hugh Lane. 0645 We leave Parnell Square North and head to Belfast; on the way our guide will regale you with Irish history and legends. Learning about Ireland as you travel on our luxurious coach is a big part of the experience. To break up the drive, we make a quick stop at a service station. This is a restroom break and it allows guests to stretch their legs, grab a coffee, and perhaps grab something to eat. Occasionally we will also pick up a few more passengers from Belfast before moving on to the first main stop of the day: the Dark Hedges. 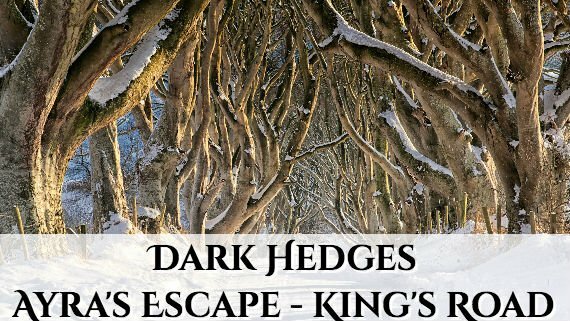 The Dark Hedges is one of the most enchanting places you will ever visit and it featured several times on Game of Thrones™, serving as a particularly impressive part of the King’s Road when Arya Stark was on the run, disguised as Arry. While it’s called ‘The Dark Hedges’ it’s really two long stretches of beech trees lined up, leaning into one another. There’s nowhere else like it in the world, so even people aren’t fans of Game of Thrones™ will want to get out and take a few photos. 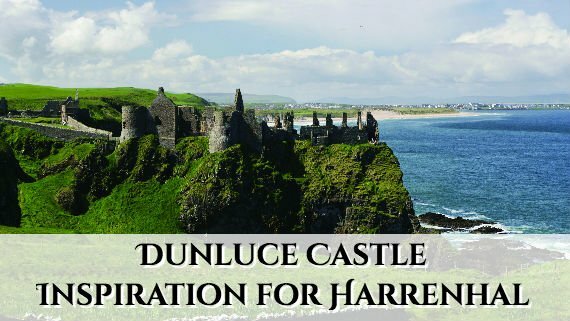 Here you will have the opportunity to take a few pictures of the castle ruin that was the inspiration for Harrenhal in the Game of Thrones™. This castle ruin built on a cliff is a photographer’s dream and well worth the stop. 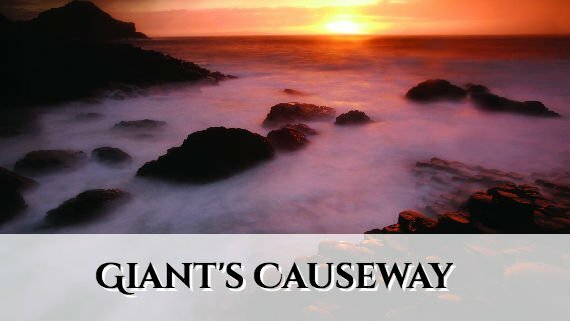 The Giant’s Causeway is one of the most popular tourist destinations in the world, and the drive up to it, along the Antrim Coast is one of the most impressive stretches of road you’ll find in Ireland. 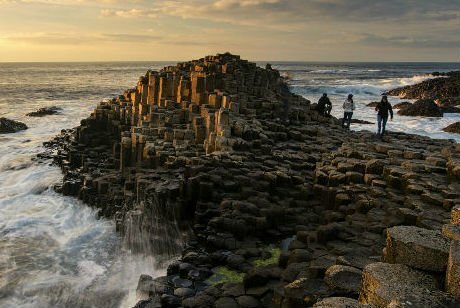 The Giant’s Causeway is an incredible spectacle and fans of geology will be interested in the fascinating hexagonal formations of the basalt columns. 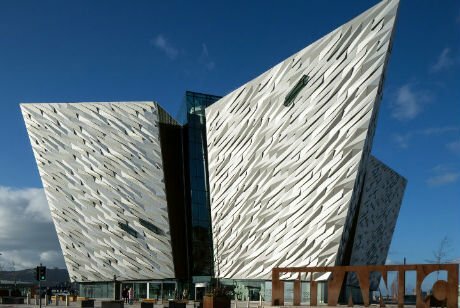 You can also take our Titanic Museum and Giant’s Causeway tour from Belfast if you’re spending some more time in Belfast during your visit to Ireland. Comprised of around 40,000 basalt columns, the Giant’s Causeway is the perfect destination for anyone interested in geology. It was created by a volcanic eruption where the molten-hot lava met the cold Atlantic Ocean. While the Giant’s Causeway technically reaches right to Scotland, it can only be seen properly from the coast of Northern Ireland. However, the basalt columns that were created were actually part of a much bigger rock formation called the Thulean Plateau that was split up due to continental drift. You can find the Giant’s Causeway’s rock columns in Iceland and the Faroe Islands. 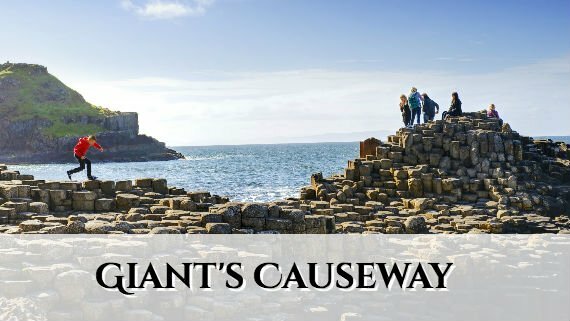 On this Giant’s Causeway tour from Dublin, will also tell you a much less scientific story about the Giant’s Causeway’s creation: the tale of our namesake – Finn McCool. Finn McCool was an Irish giant who had a a rivalry with a Scottish giant known as Benandonner. Finn tore up all of the land from Ireland to Scotland, to create a path for him so they could battle. After losing the fight to Finn, Benandonner was said to have escaped back to Scotland, wrecking the earth as he went, and causing the hexagonal formations that we see today. However, there are more myths and legends to discover. You’ll have to take the tour to hear more! *We will not be going to Ballintoy Harbour between 11 April 2019 and 1 September 2019. Instead, you will visit the Game of Thrones™ Touring Exhibition in Belfast (entrance fee included). 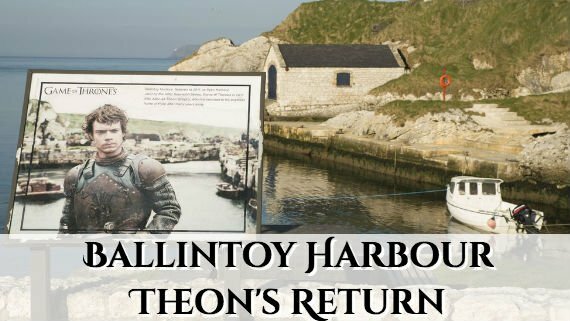 Travel to Ballintoy Harbour, the real-life setting of the Iron Islands, one of the most rugged, wild parts of Game of Thrones™. It is the home of House Greyjoy, to Theon and his family. 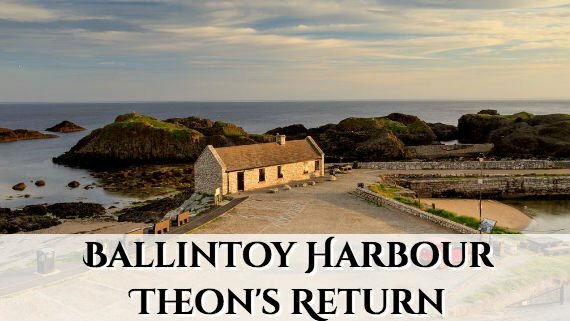 If you forget the unpleasant setting in Game of Thrones™, Ballintoy Harbour is actually one of the most pleasant and picturesque spots in Ireland. Ballintoy means “raised beach” and that’s what it is. The views are stunning and even people who aren’t familiar with GoT will enjoy themselves. We think that Ballintoy is exactly the kind of idyllic setting people want to see when they imagine visiting Ireland and we always get great feedback from our guests. We’re showing off some of the best locations in all of Ireland on this tour! *We will only go to this exhibition between 11 April 2019 and 1 September 2019. For all other dates, you will be visiting Ballintoy Harbour instead. This largest ever official Game of Thrones™ public display showcases costumes, authentic props and majestic settings from all seven seasons of the Game of Thrones™. Being the principle filming location (both in natural setting sand within Titanic Studios) of this Emmy award-winning series, there is no surprise that HBO has decided to host this unique, interactive and immersive exhibition here in Belfast. In this Game of Thrones™ Touring Exhibition, you will have the chance to see the regal settings of King’s Landing, view the iconic costumes of House Targaryen, explore the conquered city of Meereen with its garrisons of Unsullied warriors, view Castle Black, the home of the Night’s Watch etc. 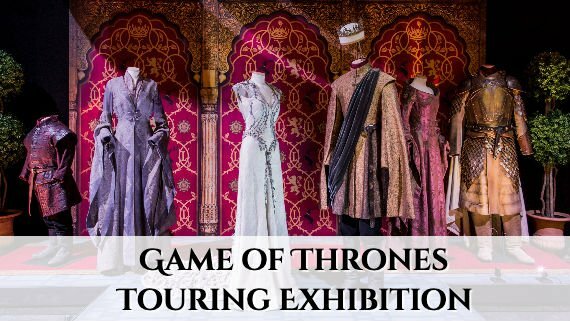 You will have the opportunity to immerse yourselves in the world of Westeros and Essos, be dropped into the centre of the Seven Kingdoms for an up-close and personal look at the craftsmanship and artistry behind the show. Visiting Belfast is the last stop on this tour, before heading back to Dublin. However, if you plan to stay in Belfast, let us know in advance and we can part ways at this stage. 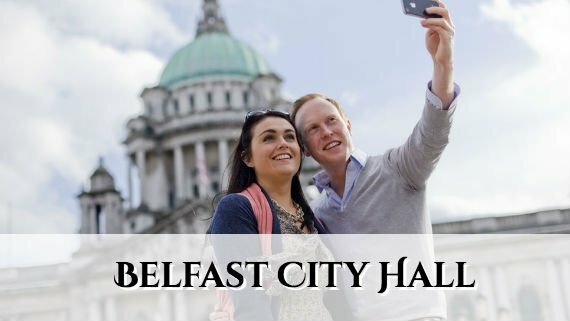 As Belfast city centre itself is quite small and compact, 60 minutes is enough time to explore the city centre and get a feel for it. 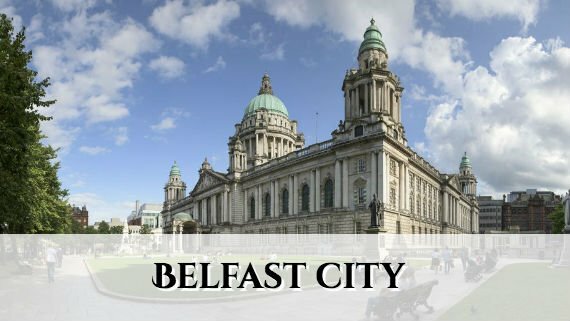 See interesting things like Titanic Memorial Gardens next to Belfast City Hall, the shopping streets, or grab a pint of Guinness in one of Belfast’s famous pubs. Note that Northern Ireland is part of the UK and uses Pound Sterling. If you’re impressed with Belfast and plan to stay for a while, you may be interested in our range of Belfast tours. *This tour is independently operated by Finn McCools Tours. 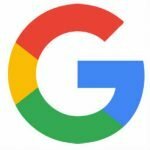 It is not sponsored, endorsed, or affiliated with HBO or anyone associated with Game of Thrones™. **Please note that all times are approximate. The locations might be visited in a different order, depends on traffic and weather. ***Game of Thrones™ Touring Exhibition in Belfast is only open from 11 April 2019 to 1 September 2019. 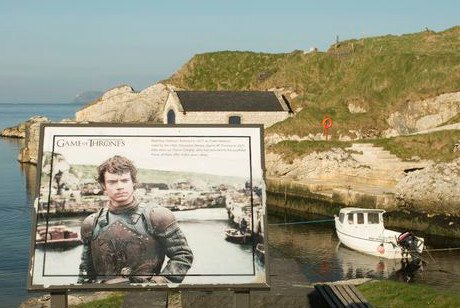 For tours between 11 April 2019 and 1 September 2019, instead of Ballintoy Harbour, you will be going to the Game of Thrones™ Touring Exhibition in Belfast. For all other dates, there will be no touring exhibition. Instead, you will visit Ballintoy Harbour where they film as Iron Islands. Please get in touch if you have any questions about this Game of Thrones™ and Giant’s Causeway tour from Dublin. At Finn McCools we endeavour to give you a well-rounded experience of Northern Ireland – taking you to the best and most breathtaking spots in the country, whilst taking you to the locations where the Game of Thrones™ episodes were filmed. 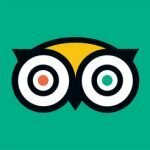 If you are looking for a tour where you can run around with plastic swords, or take pictures next to cardboard cut outs, we are not the right tour you are looking for! Our tour is not a Game of Thrones™ tour for dummies where we will be reciting every cheesy line ever mentioned in the Game of Thrones™. We are taking you to the most pictured sites in the North and making you feel like you are in the frame, with some insider information from our Measter guides who will show you clips to refresh your memory and show you that we are in the exact spot where filming took place. Not suitable for people with limited mobility. A fair bit of walking involved. Not suitable for children under 10. If your child is very used to travelling, please book 1 seat per child and bring your own child seat. We went To Giants Causeway + game of thrones™ – tour. Recommending this to all Got-fans, also others will enjoy. Very professional driver (Andy) and entertaining and educational trip guide Derrick with amazing energy, guitar play with singing. We went on the game of thrones™ tour of Northern Ireland and we cannot recommend this tour enough. Our guide Tara was amazing, as was our driver Mark. The sights themselves were incredible, I would recommend this tour even if you’re not a diehard GoT fan just because you get to see so much of the beautiful countryside and many sites that are off the beaten path as well as the more “must-see” sites in Northern Ireland. I cannot say enough good things about our host Tara – she had the best stories and was able to give us a lot of history without ever sounding boring. She always told stories in an easily accessible and easy to understand way and she made our day so much fun. 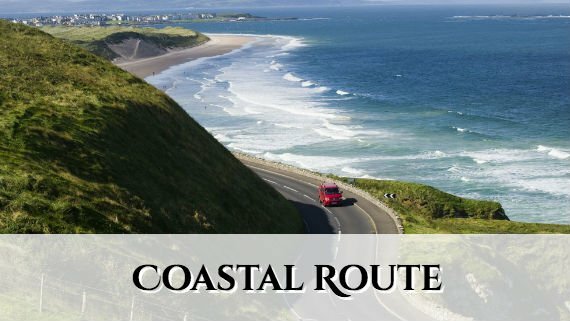 Definitely do this tour if you want to see the best of Northern Ireland! Gavin was great fun and told just the right amount of stories. The tour takes you to stunning places and you have enough time to walk around and have a look at the beautiful sights! Really liked that there was music on the bus which created a really nice atmosphere. We decided to do tours from Dublin, instead of renting a car while in Ireland. This tour was fun and interesting. Our tour guide was great, she shared a lot of information and was funny. We also had the opportunity to see a lot. I knew I would enjoy this but I didn’t think it would be as much as I did. Ireland is so beautiful, I look forward to going back soon. Our tour was wonderful. Our tour guide shared many details of the country and towns we passed through. The driver and guide were both very helpful and welcoming. I would do the tour over again just because they made it so enjoyable. I wish I could remember their names. 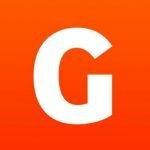 (Sorry guys) 10/10 would reccomend this company to anyone looking to see some of beautiful Ireland. My boyfriend thought this was a fantastic tour! My friends had recommended it even though they know I’ve only seen a season of Game of Thrones. The views were breathless and our tour guide (Derrick (?)) was great, especially summarizing the scenes for me at each location without spoiling too much for me :) And he was pretty darn funny.